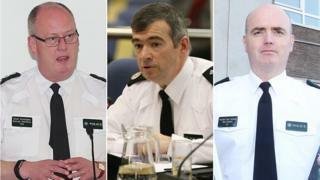 Northern Ireland's two most senior police officers are under investigation for alleged misconduct in public office and criminality that could amount to conspiracy to pervert the course of justice. Chief Constable George Hamilton and his deputy Drew Harris are being investigated by the Police Ombudsman. Assistant Chief Constable Mark Hamilton is also under investigation. The men deny the allegations. Here is the statement from the Police Service of Northern Ireland. "PSNI can confirm that a number of senior officers including the Chief Constable and Deputy Chief Constable have been informed of complaints made against them by former senior PSNI officers. The complaints relate to allegations of misconduct by senior police during a criminal investigation by the PSNI into the two complainants, former senior colleagues, during 2014. "PSNI acknowledges and supports the need for the Office of the Police Ombudsman to investigate these allegations and all officers are co-operating fully with the investigation. "The Chief Constable, Deputy Chief Constable and other officers completely refute the allegations made against them and are strongly of the view that these complex investigations into the complainants were conducted with professionalism and integrity. This position has been fully outlined in the Officers initial response to OPONI (Office of the Police Ombudsman of Northern Ireland). "Whilst ordinarily, the Police Service would limit its responses on matters where it is under investigation, this case has particular and unusual aspects to it. "This case has been the subject of recent speculative press and media coverage which has the potential to negatively impact on public confidence in policing. "We have full confidence in the OPONI to complete a thorough investigation and we trust that they are left to do so without ongoing public commentary."